This was the wedding card that I made for Heather. I made two just so I would have an extra. It was really simple and quite elegant. It's just whisper white cardstock with a pattern from the textiles paper from SU. 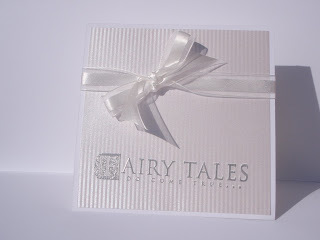 I then embossed the "Fairy Tales" in silver and tied the organza ribbon around the card. Inside he card, I used the same textiles paper and punched out a heart. Behind the heart, I put a small piece of paper to pop it out. I also embossed the inside saying to keep it looking the same. Thanks Trista for letting me use your stamp set!! I had to buy one myself after this.